Swim Rotorua junior swimmers have enjoyed a successful start to 2018, including 42 medals and an overall win at the AquaKnights Junior Festival. Such success has been built on community involvement and encouraging young people to learn to swim, whether it be with the aim of competing or to ensure safety in and around water. 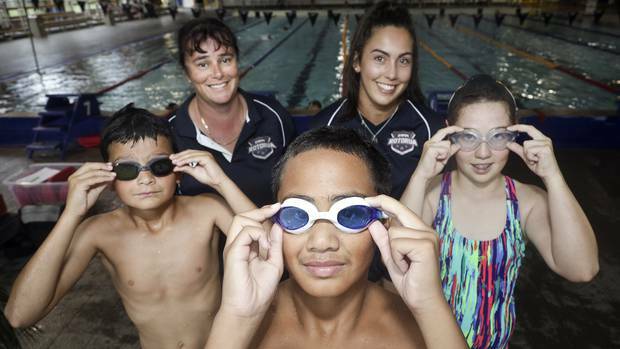 Head coach Alastair Johnson said Swim Rotorua prided itself on being a community club led by an enthusiastic team of coaches devoted to helping all swimmers achieve success in and out of the pool. With New Zealand drowning rates high and the vast majority preventable, swimming clubs play an important role in water safety with young people. Swim Rotorua plays an active role in the Rotorua community with the Kia Tu Whakarereke - Making the Difference Water Safety Programme in partnership with the Rotorua Lakes Swim School. The programme is designed to upskill the swimmers at either the aquatic centre or their own school pool. Over the past two terms more than 1400 children have enjoyed structured lessons based on Water Safety New Zealand's 'Water Skills for Life' syllabus. The Swim Rotorua Junior Academy places an emphasis on building friendships, improving swimming fitness and having fun. The partnership with the Rotorua Lakes Swim School has seen a number of promising young swimmers graduate from the Swim School into the Junior Academy. Junior Academy coach Tara Watt said she encouraged all young swimmers to practise their skills with passion and purpose, and to enjoy what they did. Johnson said he was excited about the future. "We have an awesome team of coaches who support and encourage each other. Our strong focus on teamwork, friendship, fitness and fun has seen an increase in the number of junior club swimmers. We will always support our juniors no matter if they wish to compete, or whether it is just for fun and fitness," he said. Anyone interested in getting involved can call the club's 'swim line' on (022) 332 6922.